The Corolla is one of the most popular vehicle models from Toyota. This efficient sedan provides plenty of options for drivers to choose from when they are searching for their perfect fit. Between the trim level options and the exterior color options, your Corolla can look just how you imagined it. 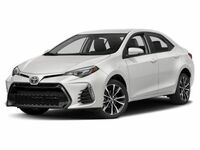 The 2019 Corolla is equipped with a 1.8-liter engine that provides 132 horsepower and 128 lb-ft of torque. This engine provides drivers with an estimated fuel economy of 28 city and 36 highway mpg. If this efficient sedan sounds like one that you would be interested in, be sure to continue reading to learn about what else it has to offer. Or click on the button below to view our current Toyota Corolla inventory! As we mentioned above, the 2019 Corolla is offered in six different trim levels. These models include the L, LE, LE Eco, XLE, SE and XSE. With each trim level starting at a different price and offering its own set of standard features, drivers should have no problem finding a car that fits their needs and their budget. The new stylish and sporty interior of the 2019 Corolla gives the car an enhanced feel. The fluid dashboard in the front seat is made up of premium materials while the available SofTex® seats are comfortable and were designed with passengers in mind. There is plenty of technology inside the 2019 Toyota Corolla, but perhaps one of the most convenient features is the Smart Key System with Push Button Start. You will never have to waste your time searching for your keys inside your bag or pocket again. Unlock the doors and trunk or start the vehicle with just the push of a button. The 2019 Corolla is just one of the many vehicles that Toyota of Hattiesburg has to offer. Whether you are looking for a new vehicle or a pre-owned vehicle, stop by our dealership today to find the right one for you. Click on the button below to receive more information regarding the Toyota Corolla!